The Bus trip from Ft. Benning to Orlando was pretty uneventful. It was a short seven hour trip. The best part was our arrival -- back in a hotel, with satin-like sheets, and an entire weekend to enjoy them. I didn't know I could sleep so much on Saturday. It did manage to socialize with the rest of the unit for about an hour and a half during lunch -- but managed to make my way back to my room for my afternoon nap. My wagon was draggin'. The training here at the headquarters is going well. Rather than overwhelm us with briefings, they sprinkle them around the training day. The briefings as to what our jobs will be once we deploy are extremely interesting, and we are on the edge of our seats to learn more! Most everyone knows and is familiar with Microsoft Office (to include Word, Excel, and PowerPoint). Today, we had classes on Microsoft Office and those particular programs. Most of the soldiers were amazed that they could truly be taught something in the classes. The military has a way of dressing up briefings with slide presentations, and most of us are self-taught, or have a buddy who has taught us what we need to know to navigate through the programs. Our instructor was fabulous, and was really able to teach some "PowerPoint Rangers" something new. Ed is flying to Orlando on Friday, and am looking foward to spending a weekend with him. We've never been to Epcot, and are making plans for Saturday!!! This morning we took a break at 10:39 to watch the Space Shuttle Discovery Launch. Kennedy Space Center is not far from here, and we were able to see the Space Shuttle after it launched. Truly breathtaking to watch it -- even though we were quite a way from the launch pad. I'm learning how to publish pictures, so I promise more soon! Less Than 24 hours left at Ft. Benning! I've decided that only in the Army does a person get up at 0315 (that's 3:15 am) to report to formation at 0430, to get on a bus at 0515 (half of us didn't have to draw our weapons from the arms room this morning), to get bussed across Ft. Benning to the Dining Facility or DFAC (mess hall) to eat, then find time between 0610 and 0630 to catch a "combat nap" on a concrete basketball court, to get in a formation to march up a hill to the training area, only to get pulled out of training to get back on a van at 0700 to go back to the offices to help coordinate logistical "stuff". 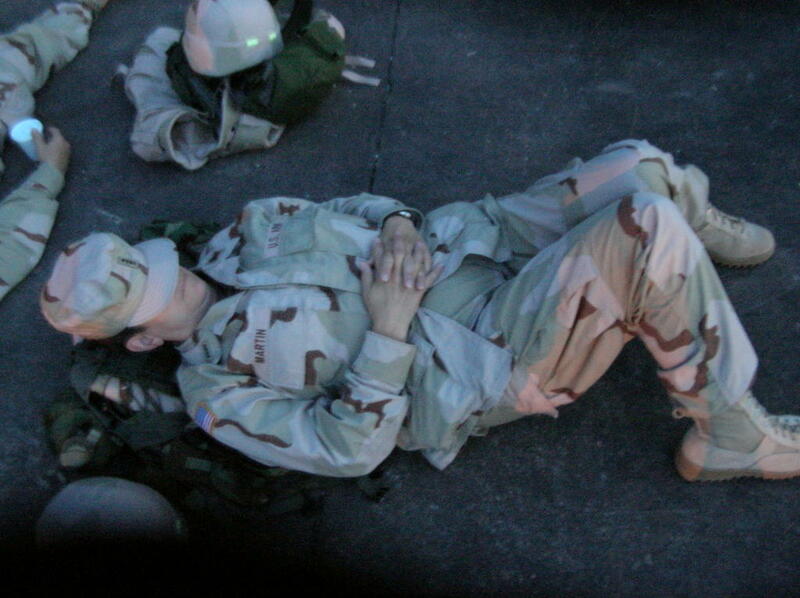 Wow -- The picture is the demonstration on how to catch that "combat nap"!!! Seriously, we get up at crazy hours, and get to where we need to be. It's tough to get 90+ soldiers from one point to another, particularly when the majority of them are officers, and well above the age of 22!!! It's been a long time since basic training, but we're all adjusting! A few more hours here at Ft. Benning, and I'll write again when we get back to Orlando. Hi All ~~ One week down and one week to go at Ft. Benning, GA. A place my husband called "home" for most of his active duty career, as well as a place where our Son learned how to jump out of perfectly good airplanes!!! The inprocessing has been extremely detailed -- dental, medical, personnel, legal, finance -- you name it -- they cover all the bases. My left upper arm is still sore -- shots. If you're ever required to get both an Anthrax AND a Yellow Fever shot in the same day (as well as in the same arm) -- try to decline!!! It hurts!!! Then to add to the pain -- I had to get a small pox vaccination on Friday morning. Remember those of us that are close to my age how we thought we were vaccinated against small pox for life. Those of us bearing the round little scar on our upper arms -- well....surprise -- now "they" say that the vaccination is only good for ten years!!! The training has been pretty good. Very theatre specific -- a lot of hands on classes with what we can expect when we get to Kuwait. Many of the classes I'd like to repeat, or at least ask for "do-overs", because I don't think anyone can be prepared enough. Friday afternoon we had classes on our individual weapons that we'll carry. I have a 9mm pistol, and until Friday only knew how to requisition, account, store, and inventory all of those 9mm's. The range was Saturday morning, and I qualified my first time up! Needless to say, I was thrilled!! I asked to go to the back of the line and re-fire. The instructor said -- you don't need to -- you qualified. Remember how I feel about the "do-overs"? I wanted to go back, just to fire again -- so they let me. My daily wardrobe changed this week from Army Green to Desert Tan. On Tuesday, I felt like we were filming the movie Private Benjamin. Each of us were issued three duffle bags, and shuffled through a huge warehouse collecting all of our new clothes and equipment. I hadn't done the "duffle bag drag" since basic training over 30 years ago. The best part of the desert uniform -- you don't have to shine the boots. Those of you who see me uniform on a daily basis will understand that comment! Remember hearing all of the hype about soldiers not having all of the equipment they need -- we're getting it now -- to include the proper body armor! My roommates (2 Majors) are still laughing about something I said after we got back to the barracks with three full duffle bags. As we were unpacking and putting equipment together. I unpacked my IBA (Interceptory Body Armor) and not one but two plates that are part of the IBA. My comment was... "this is great -- they're thinking ahead. They've given us a spare, in case the first gets shot." Janet calmly said.... "Candy, one is for the front and one is for the back." I'm learning!!! All of my friends that are, or have been, in theatre -- don't laugh -- just look out for me! Did I say that Yellow Fever and Anthrax shots hurt! Many of you know (or have heard) that I volunteered for deployment in support of Operation Iraqi Freedom. I volunteered to go with the 143rd Transcom, a transportation command out of Orlando, FL, who is operating and managing the ports in Kuwait. My job is still being molded as to exactly what I'll be doing -- however, I know that I'll be working with the accountability and documentation of Army equipment that is left in theatre by units returning to the states and have leaving their equipment in theatre for other deploying units to use. That's the civilian description. In military terms -- I'll be the PBO for SBE!! I spent my last weekend home in perfect style -- at a beach house south of Galveston, TX. Ed & I, and all the kids (along with some significant friends) joined some longtime good friends for a relaxing, fun, 4th of July celebration. I left for Orlando on July 7th and will be here for just a few days. We travel to Ft. Benning, GA (by bus) on Sunday and meet up with the rest of our team. We'll be at Ft. Benning for two weeks of military training, then back to Orlando for a few more weeks before we travel to Kuwait. A lengthy military career in a variety of locations has always proven to be beneficial to me. After I got to Orlando -- sure enough there are some team members that I served with in previous assignments, as well as several that I'd "heard" of from other Army buddies. It's going to be a great team to serve with. Our team when fully assembled will be approximately 90 soldiers -- all of whom have volunteered!!!! We are scheduled to work in Kuwait, and will be getting there at the hottest time of the year -- where the mercury reaches 130+. I hope to send updates by email periodically. I won't have a mailing address for a couple of months, so the best way to reach me is via email. I'm anxious about getting on with this assignment, because my 365 days "boots on the ground" start counting the first day I get in theatre. The quicker we get there -- the quicker we get back home to family and friends.